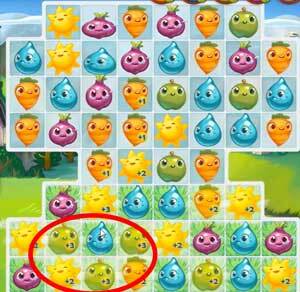 These Farm Heroes level 43 cheats and tips will help you beat level 43 of Farm Heroes. 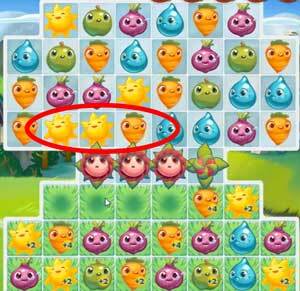 The objective of Farm Heroes level 43 is to collect 4 flowers, 66 apples, 60 carrots, and 60 suns in 24 moves. 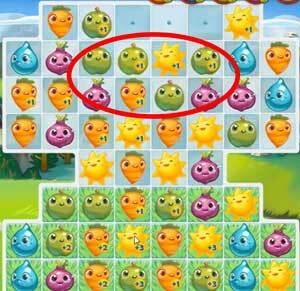 The goal of Farm Heroes Saga level 43 is to collect 4 flowers, 60 apples, 60 carrots, and 60 suns in 22 moves. You should work on the flowers first since they block cropsies from falling onto the grass. When you are able to clear all the flowers, you’ll have much more flexibility and you can use grass and cascades to their full effects. As always, prefer to clear flowers with the resources you actually need to collect. Grass keeps cropsies happy, and working low on the board also helps more cropsies fall and clear as you make moves beneath them. Make your clears on the grass, and you’ll get more bonuses, and it will be more likely to cause a cascade, which can collect resources you need without you actually doing anything. Though it’s best to work low at all times, if you find you’re low on moves and you need only one or two types of cropsies, you should look for the cropsies you need wherever they are. Sometimes, you’ll be able to beat the level by finding the cropsies high on the board, or sometimes cropsies higher up may be worth more than those on the grass.